Italian builder Canados announces a new 108 flybridge model, to fit in nicely between its current 86- and 120-foot superyacht lineup. In a departure from previous Canados flybridge yachts, the 108 features first-time design elements such as large side windows in the hull on the side decks to allow more light to flow into the main deck to the dining room and the owners' stateroom, respectively. The owners' stateroom is forward on the main deck affording excellent views. Six guests are accommodated on the lower deck in a VIP, a double and a twin. Exterior and naval architecture will be completed in-house by Canados. Like her Canados yacht sisters, the 32.7m 108 flybridge will feature custom interiors by Cristiano Gatto Design. Gatto's has chosen light oak for the walls and furnishings and teak flooring. Powered by twin MTU 16V 2000 M94, she is estimated to cruise at 24.5 knots, reach a top speed of 28.5 knots and have a range of 480 nautical miles at cruise. 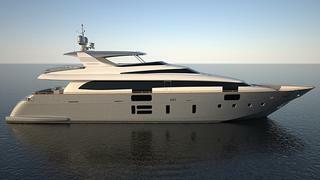 The Canados 108 is scheduled to be launched summer 2013.